Now I realize that I usually review free product that enterprising GMs might find useful at their table, but sometimes I'm simply just impressed by something that might be overlooked by the "I don't care unless it is free crowd." 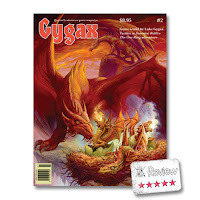 Gygax Magazine is a quarterly magazine that does a lot more than just pay homage to the classic Dragon magazines that I'm immediately reminded of. The content of this magazine was quite interesting for a number of reasons. I have to admit that I was a little put off initially by the 12 full pages of ads. There were more than 12 pages of adds, just that there were 12 pages that were only ads. I was half-tempted to go grab a random issue of Dragon and see what the full-page ad to content ratio was but that seemed pointless. Although I was initially put off by ads I remember, back in the day, when I really enjoyed those ads because I got to learn about new products I wouldn't otherwise get to know about. Just getting my hands on a copy of Dragon was hard enough, much less other game items. I remember being able to locate an address, in a Dragon ad, to be able to order a miniature catalog. This particular issue did a lot to allow me to reflect upon my earlier days of gaming. Two particular articles, The evolution from wargaming to role-playing (by Ernest Gary Gygax Jr.) and A forgotten grimoire and its curse (by Jon Peterson) were quite fascinating looks at the origin of the original Fantasy Role-Playing Game. In previous posts I've written about the wonderful resources of the Roll for Initiative Podcast (RFI) and Quick Primer for Old School Gaming. RFI host DM Vince had a great article about The old-school renaissance on page 30 that I found as a great read...and he lists the primer as his first resource. 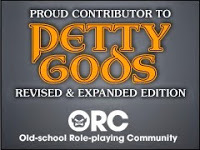 RPGs, but many of them...well at least the RPG based articles, seemed to have some great content that is easily adaptable to almost any RPG. The article on death and dying and a new monster are two such articles I can see borrowing from some day. Gygax Magazine is available in print for $8.95 (plus shipping) from their webstore and you can download a PDF from DriveThruRPG for $4.99. Excellent review! I've been keeping an eye out for reviews for this magazine. I'd love to get a dead-tree sub to a quality RPG magazine like Dragon and Dungeon used to be. I believe from what I've read this'll do nicely.